Poor Lacey. Snow and ice get in between her toes when she goes outside during winter. It hurts so much, my snow dog stomps romping and digging and crumbles into a little ball from the pain. You try playing in the snow with bare feet. I bet it hurts too. I scoop her up and carry her home. Often we have to go back outside after Lacey's toes are warm to finish what she didn't get to do outside in the snow. Rinse. Repeat. As much as I hate putting clothes on dogs for the sake of putting clothes on dogs, I bought Lacey a pair of dog boots for Christmas. I'm all for protective dog clothing if the dog needs it but I still felt like one of those people while in the store buying shoes for my dog. I didn't feel that way last weekend when I tried to exchange the boots for a size that fit Lacey. All of the pet stores had a run on dog boots to prepare for the Polar Vortex Storm That's Colder Than Antarctica (for real. 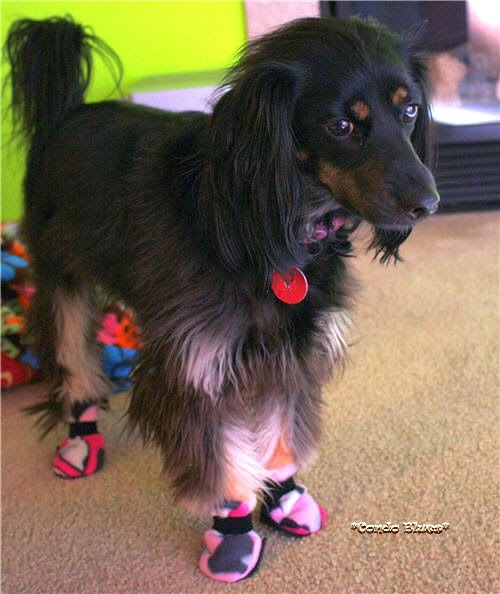 It is summer in Antarctica and 45 degrees warmer in Iceland (36 F) than in Columbus, Ohio today (-9 F. ) It looks like I am not the only crazy pet parent in Columbus putting boots on my dog. Good to know. The only thing left in Lacey's size in Store Number Three were a set of disposable dog booties made from recycled plastic bottle fabric. I was less than thrilled with the disposable part, but any port in a storm. I hoped Lacey could wear them several times and see us through the cold snap. No such luck. Lacey's dachshund claws started to poke through the second time out. 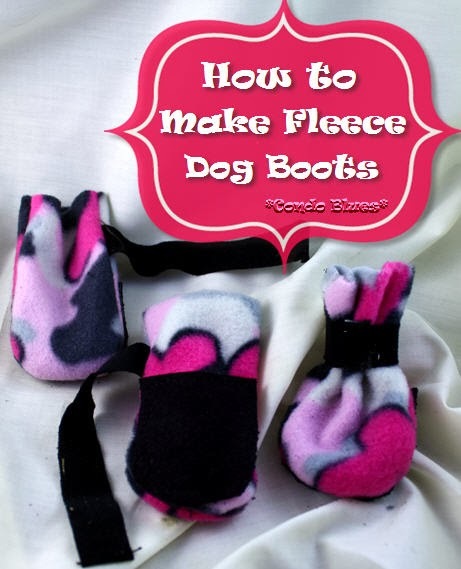 Time to make fleece dog booties! 1. Have/ask/bribe your dog to stand on a blank piece of paper. Use the pen to make a mark on either side of the dog's paw, as well as the front and back. 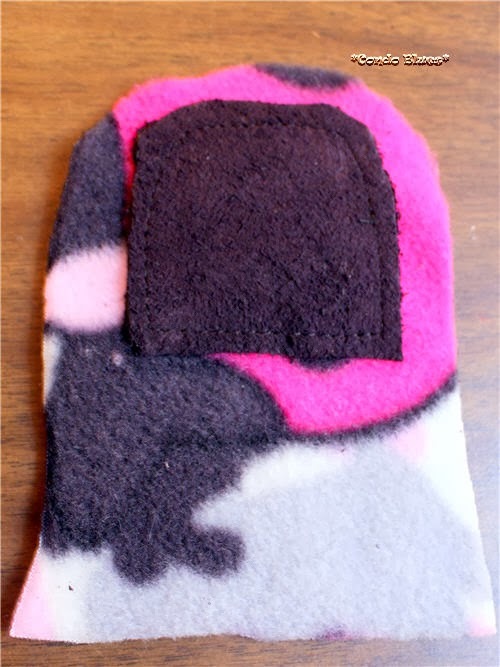 This will be the size you need to make your fleece dog boots. 2. If you have an extremely patient dog, trace their paw on a piece of paper to make a paper dog boot pattern and add at least 1/4 of an inch or more to the tracing for a seam allowance. My dog wanted none of this. 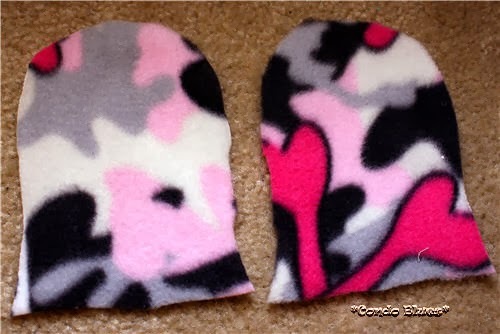 I made my pattern by tracing one of Lacey's disposable dog boots. Leftover fleece from PJ's my Mom sewed for me for Christmas. Aw, we match! 4. Make a pattern for the boot sole by tracing the paper boot pattern on a piece of paper and cutting it slightly smaller. 5. 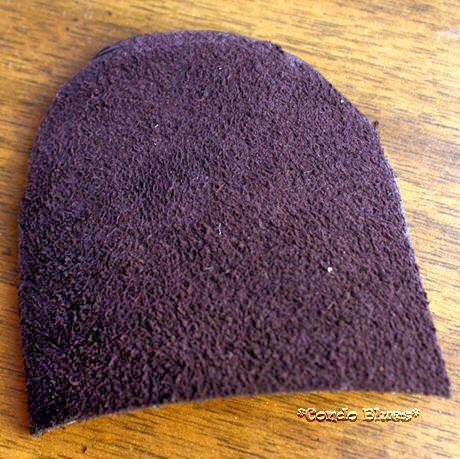 Use the sole pattern to cut four dog boot soles from leather, suede or another type of waterproof fabric. I'm using leather scraps I have left from a craft fail. If you have an orphan or old leather or suede gloves, you can use that too. 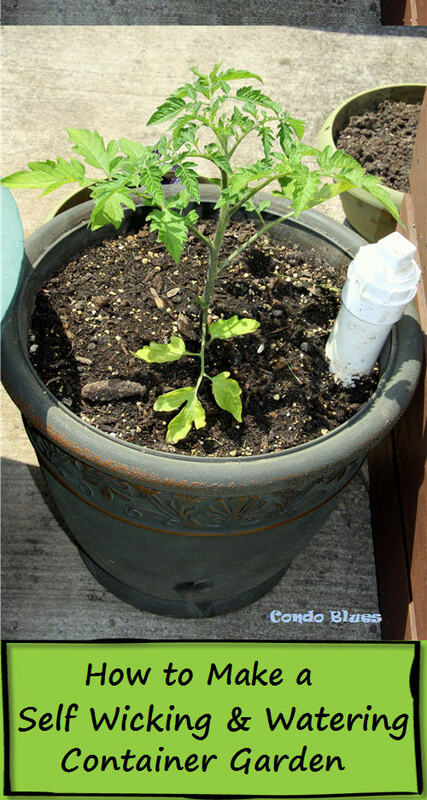 The idea is to use use something waterproof for the sole because a wet fleece boot can also lead to frostbite or hypothermia. Not to mention, who wants to run around in soggy, wet socks? Me neither. 6. 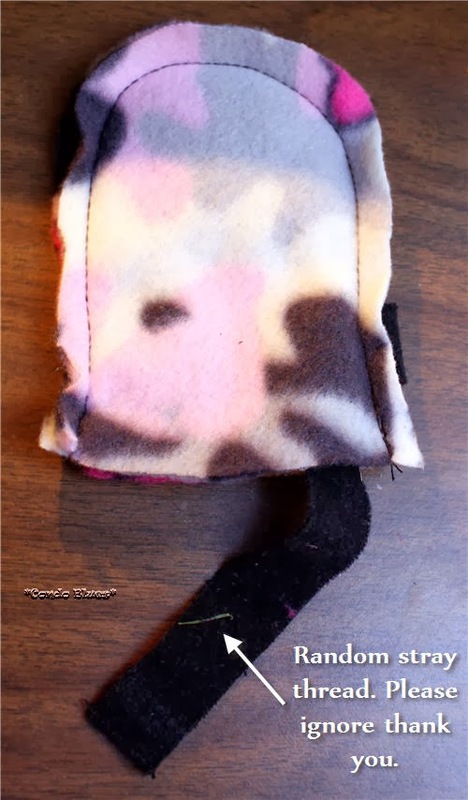 Use the sewing machine and thread to sew the dog boot sole to the bottom of dog boot. Remember to leave room for the seam allowance when you sew the boot together. 7. 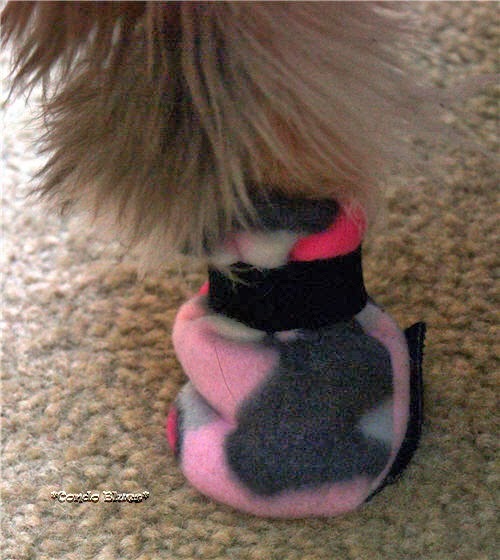 Measure the circumference of your dog's leg and cut a piece of ribbon/elastic to that length for each dog boot. You should have a total of four boot straps. 8. 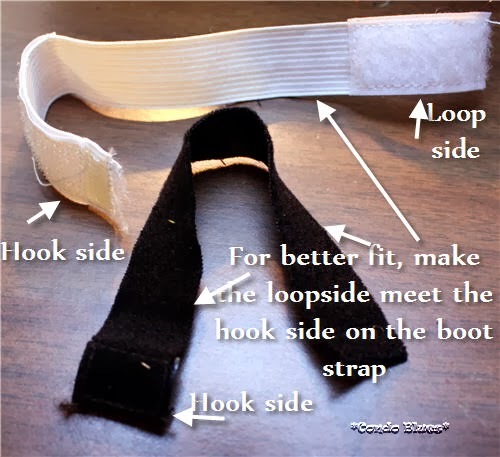 Make the boot strap by sewing a piece of hook side of the velcro to one end of the ribbon/velcro and a larger length of a length of loop side of velcro to the opposite edge and side of the elastic/ribbon. I am using the black boot strap that has enough loop velcro to allow me to wrap the strap tightly around Lacey's legs because she hates wearing dog boots and tries to kick them off. I'm showing you the white strap because you can see the velcro closures better than on the black strap I used. One of the reasons the white strap didn't fit Lacey is the loop side of the velcro didn't meet the loop side on the strap so I couldn't tighten them around her slim legs and she kicked them off with a vengeance! 9. 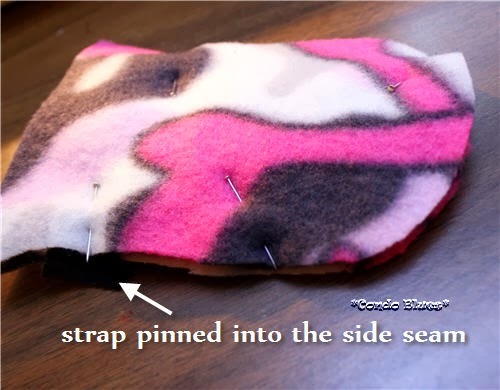 Pin the rights sides (the pretty part) of the dog boot together and pin the boot strap into the side seam. 10. Sew the boots together with the sewing machine and thread. 11. Remove the pins and turn the boots right side out. Lacey is showing a little leg. You are in trouble Lisa if my boyfriend Max laughs at me when we walk past his house. But at least I can have a proper walk now and play in the snow. I love snow!